The Eastern Imperial Eagle (Aquila heliaca, SAVIGNY, 1809) is one of our outstanding natural values. According to the Hungarian Red Data Book, the species is threatened with extinction. Majority of its European population breeds in Hungary and Slovakia, on both sides of the border between those. The species belongs to the Accipitriformes order, and within that to the Accipitridae family and Aquilinae subfamily. Its body length is 72-83 cm; the wingspan is about 190-210 cm. The species shows slight sexual dimorphism, however, females are a bit bulkier. Males weigh around 2,5-4 kg while females about 2,8-4,5 kg. Eurasian species. Its distribution follows the steppe zone in Russia and Ukraine from the northern part of the Caucasus to Lake Baikal. In Europe, it is restricted more or less to the Carpathian Basin. It breeds in Hungary, Slovakia, Croatia, Serbia, Romania and Bulgaria. A smaller population breeds in Turkey, as well. In Hungary the westernmost pairs nest in the Transdanubian Middle Mountain. Outside of Russia the only significant population can be found in the Carpathian Basin. Nowadays, half of the population nests in the middle mountain ranges, however, more frequently occupies territories in lowlands, primarily in close vicinity of the mountains. It is a strictly protected species in Hungary, belonging to the highest conservation value category of 1.000.000 forints. MME prepared a Red List in 1999, which lists it in the category of conservation-dependent species. The number of nesting pairs has been decreasing in almost every country, therefore, the slow growth of the population in Hungary is particularly important. The conservation of the species could be achieved on the whole distribution area with the conservation measures applied in Hungary, i.e. legal protection, providing safe breeding and foraging habitat, etc. Since the late ’90s, half of the population has established territories in agricultural areas. Before they settled in southern valleys of the middle mountains. Prefers grasslands with existing suslik population. Often chooses lone trees or lines of trees that cross agricultural parcels. The Eastern Imperial Eagle build their nests on the top of large trees in southern facing slopes or close to the foraging sites. They often have more than one nests in the territory. In undisturbed areas the nest can be used for dozens of years, thus it becomes enormous due to renovating it year after year.In lowlands, they change their nests more often than in the mountains, probably because of higher level of disturbance. Nests are always positioned to have a good view. Therefore, they can recognize disturbance, to what the species very sensitive, at great distances. The clutch is full by the end of March, usually consisting of two, and, recently not infrequently, of three eggs. Later on both parents bring food for the chicks. Fledglings leave the nest in July, but the family stays together until Autumn. Altogether 388 eaglets fledged between 1991-2000 in Hungary. Their most preferred preys are the Suslik and the Hamster. 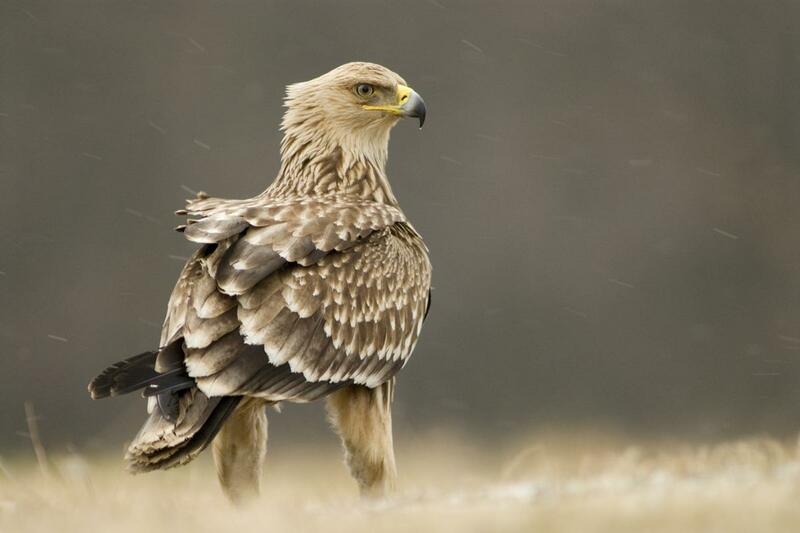 Whereas both species spend the winter in hibernation, Eagles hunt for small mammals and birds mainly in agricultural areas. In such areas, they usually catch European Hares. Parents stay and hunt together after the breeding season. Female is always the first to feed on the prey. During harsh winters, they also eat carrion, as well. If the weather is mild in the winter, the pair does not leave the territory, while immatures migrate or wander about.